Click here to enter the Titanic Chat room to talk about Titanic. Titanic chat is now open 24/7 all year. The next planned chat is 14th(-15th) April 2019. Please sign up to our email reminder. 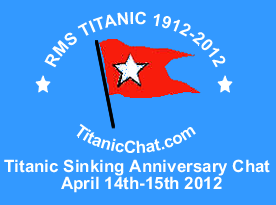 The Titanic Sinking Anniversary Chat is on now Click here to join the chat. Every year since 2004 the TDTSC Titanic sinking anniversary chat has been held in our chat room to both commemorate the Titanic disaster and to offer an opportunity for people with an interest in Titanic to meet up online and chat about Titanic. The chat has grown from a group of forum members having a very memorable chat on 14th April 2004, to an annual chat held every year â€“ now long joined by people from other Titanic groups and by anybody else who has wanted to join in â€“ with the chat usually lasting well into the early hours of the morning, and sometimes, with people joining and re-joining us, continuing throughout the next day. This year â€“ commemorating 107 years since the sinking of Titanic â€“ the chat will be held on Sunday 14th April 2019, starting at around 9pm British Summer Time/United Kingdom time/UTC+1/GMT+1 (3pm Eastern Daylight Time) and continuing at least into the early hours of the morning. A Popular time in the chat room is at the time (especially BST/UK time) that Titanic struck the iceberg and continuing until after the sinking, with a timeline of events often being posted by those joining in with the chat. It is sometimes notable that people join the chat around the time it reaches 11.40pm in each time zone, but around 11.40pm - 2.20am in the United Kingdom (British Summer Time) is usually the best time to follow the timeline of events and when the chat is at its busiest. To enter the chat room please click here. .Chat to other people interested in Titanic. .Commemorate the 106th anniversary of Titanic's sinking. .Follow the time line of events as they would of happened 106 years ago. .Discuss the history of Titanic. .For all people from complete Titanic beginners to Titanic experts. .Discuss your favourite Titanic book, model, documentary or film. .Get to know people, have fun and commemorate what happened 105 years ago at the same time. The Titanic Chat-Chat Room is online. To sign up to an email reminder for future chats (including the 2017 sinking anniversary chat) please click here. If you have any ideas or questions about the chat please contact us. We would be very glad if you could Contact us to tell us which country you are from and what times you will be able to join the chat. We are looking to re-start the weekly chat at some point after the 14th-15th April chat. If you know people who are interested in using the Titanic chat and would like a chat arranged, please contact us.